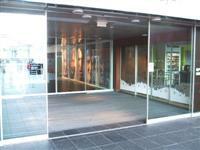 Services / facilities within the building include a library archive and internet access. 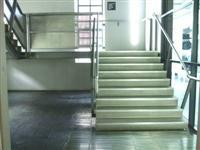 For current and future exhibitions and events, please see the venues website. Last admission is at 17:45 daily. 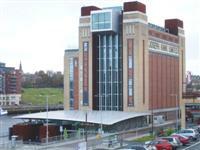 This venue is situated in Gateshead. The nearest mainline station is Newcastle Central. The nearest Tyne and Wear Metro station is Gateshead. 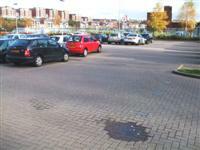 There is/are 7 designated parking bay(s) within the car park. 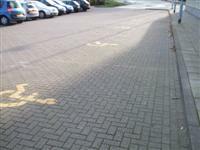 The dimensions of the designated parking bay(s) are 300cm x 420cm (9ft 10in x 13ft 9in). The nearest designated bay is 120m (131yd 8in) from the side entrance. The furthest designated bay is 150m (164yd 2in) from the side entrance. The dropped kerb does have tactile paving. The door opening is 420cm (13ft 9in) wide. You are on Outside Access (Side Entrance - Access To Reception). Skip to the next section. 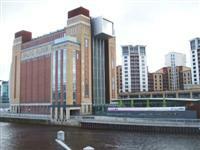 This information is for the entrance located on the Quayside. The doors are single width. The door opening is 108cm (3ft 7in) wide. This entrance is on the left side as you face the front of the venue. 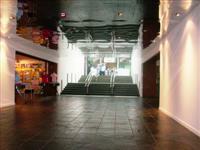 The photograph on the left shows the entrance on the left as you face the venue. The photograph on the right shows the identical entrance on the right side as you face the venue. Both entrances are push pad operated. You are on Level Change (Side Entrance). Skip to the next section. The ramp or slope is located at the side of the building. The photograph on the left shows the route from the car park to the right side of the venue. The photograph on the right shows the route from the car park to the left side of the venue. This venue does play background music/noise. Music/noise is played in the cafe. Portable hearing loops are available but notice is required. There is a fixed hearing loop in the shop. The steps are located between the entrance and the information desk. There is / are 12 step(s) to the area / service. Lighting levels at the steps are bright. The handrails are in the centre. You are on Lift (Inside Access). Skip to the next section. The lift is located in the foyer. 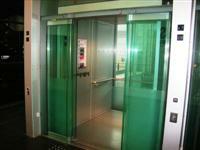 The floors which are accessible by this lift are LG-G. The lift is 17m (19yd) from main entrance. The clear door width is 89cm (2ft 11in). The dimensions of the lift are 130cm x 186cm (4ft 3in x 6ft 1in). The lift controls do have Braille markings. The lift controls do have tactile markings. 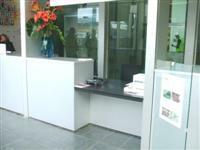 The reception desk is 30m (33yd) from the main entrance. The desk has a lowered section. Staff are trained to use system. You are on Lift (Main Building). Skip to the next section. 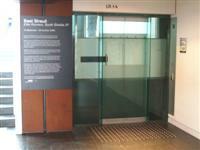 The lift is located at the rear of the information desk. The floors which are accessible by this lift are G-1-2-3-4-5-6. 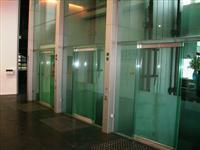 The lift is 39m (43yd) from main entrance. The clear door width is 101cm (3ft 4in). The dimensions of the lift are 170cm x 194cm (5ft 7in x 6ft 4in). 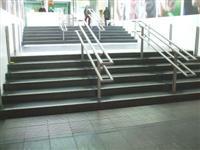 The floors which are accessible by stairs are G-1-2-3-4-5-6. You are on Accessible Toilet (Foyer). Skip to the next section. This accessible toilet is 20m (21yd 2ft) from the main entrance. This accessible toilet is located outside the cafe entrance. The width of the accessible toilet door is 79cm (2ft 7in). 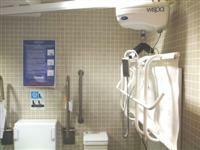 The dimensions of the accessible toilet are 192cm x 268cm (6ft 4in x 8ft 10in). The lateral transfer space is 81cm (2ft 8in). The height of the toilet seat above floor level is 43cm (1ft 5in). The height of the hand dryer is 104cm (3ft 5in). The height of the wash basin is 88cm (2ft 11in). The contrast between the drop down rails and wall is fair. There is a dedicated baby change room located within the accessible toilet. You are on Accessible Toilet (2nd Floor). Skip to the next section. This accessible toilet is 37m (40yd 1ft) from the main entrance. This accessible toilet is located to the left as you exit the lift. The width of the accessible toilet door is 78cm (2ft 7in). The dimensions of the accessible toilet are 183cm x 222cm (6ft x 7ft 3in). The height of the hand dryer is 102cm (3ft 4in). The height of the wash basin is 86cm (2ft 10in). The lighting levels are poor. The female and male toilets are located outside the cafe entrance. The female and male toilets are 19m (21yd) from the main entrance. You are on Standard Toilet(s) (Main Building). Skip to the next section. The female toilets are located to the left as you exit the lift. The female toilets are 7m (22ft 12in) from the lift. The male toilets are located to the right as you exit the lift. The male toilets are 9m (29ft 6in) from the lift. There are toilets in the same location on floors 1 to 5. You are on Restaurant Bar Internal. Skip to the next section. Food is available from the bar. Food or drinks cannot be brought to the table. The nearest table is 28m (31yd) from the main entrance. The distance between the floor and the lowest table is 42cm (1ft 5in). The distance between the floor and the highest table is 67cm (2ft 2in). 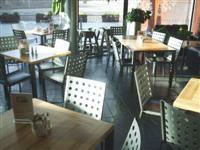 The type of food served here is sandwiches, cakes and hot meals. You are on Accessible Changing Room (Foyer). Skip to the next section. Paper cups are available on request.